Inmaculada Gómez Díaz was born in Malaga in 1985. 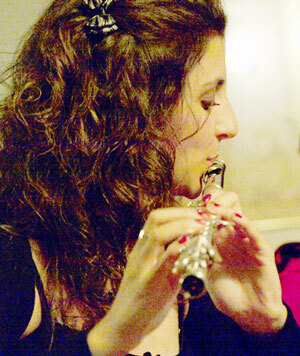 She graduated in Transverse Flute from Malaga’s Higher Conservatory of Music and has completed a great number of flute-based courses with prestigious professors such as Salvador Espasa, Fried Dähn, Barbara Rostnitschek, Gabriel Ahumada, Wendela Clarie and Paul Arhz. at the Young Interpreters Festival in Malaga’s María Cristina Conservatory and as Main Flute in the municipal bands of Mijas and Antequera; and, in 2008, with Banda Trinidad Sinfónica at Malaga’s Alameda Theatre. Despite her youth, she is involved in an intense teaching activity. She has taught members of Zamarrilla and Trinidad Sinfónica Bands and she currently teaches Transverse Flute, Piano and Musical Language at three different Music Schools: Coín’s School of Music, Alhaurín de la Torre’s Municipal School of Music and Torremolinos’ Albergue de la Música – where she also teaches music to disabled children. She is currently studying a Music Teaching Degree in Primary Education.